I have borrowed and slightly adapted this recipe from the March issue of Good Food magazine when I was baking up a pretty huge batch of baked goods for a farewell gift for my old office. I usually take in brownies or cookies, so I thought something sweeter, bright and colourful would make a nice change. I’ll admit the decorating didn’t quite go as planned and they did look a bit messy but they still looked nice and colourful and went down really well in the office. 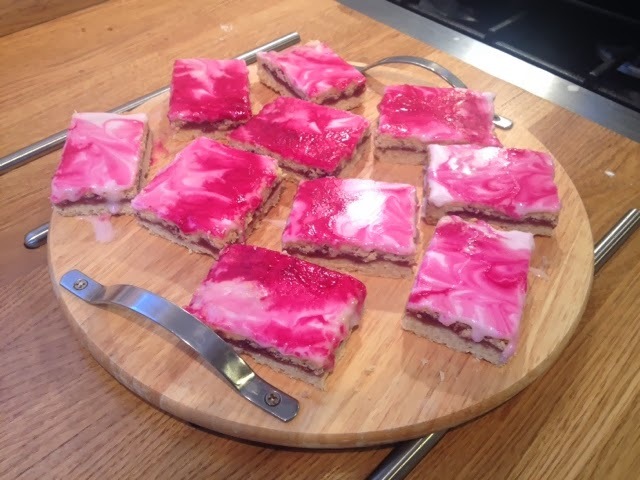 I’d really like to try making this with different types of jam, I think blackcurrant would work particularly well. 1. 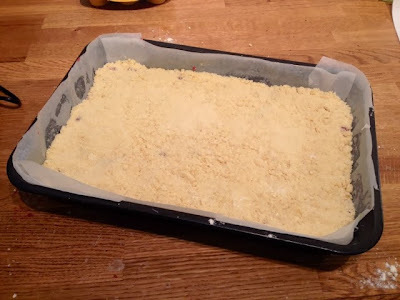 Preheat oven to 180°C and line a baking tin with greaseproof paper. 2. 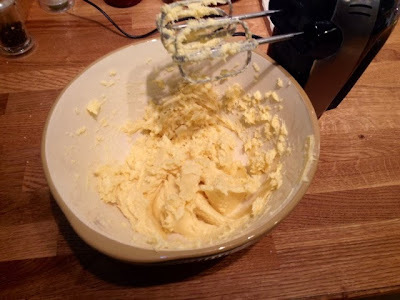 Beat together the butter, sugar, egg yolk and vanilla extract in a bowl. 3. 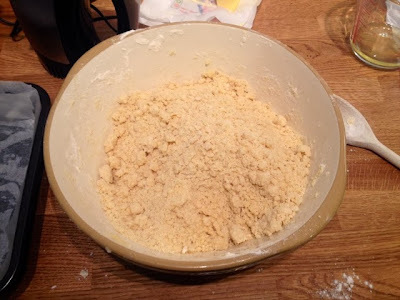 Stir in the flour and salt, bringing together to form a crumbly dough, it might be easier to bring it together if you get stuck in and use your hands. 4. 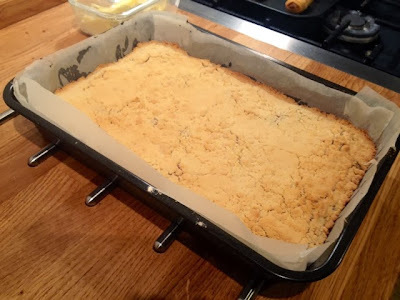 Take half the mixture and press into the baking tin. 5. Spread the jam over the shortbread base, leaving a little gap at the edge. 6. 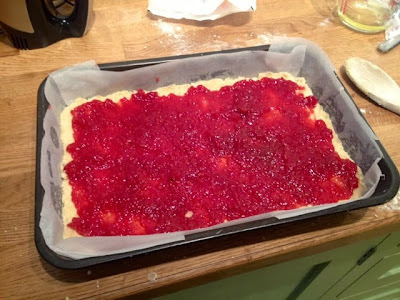 Evenly spread the remaining mixture on top and press down gently, trying not to disrupt the jam too much. 7. Bake in the oven for 35 minutes until its a pale golden colour on top. Leave to cool. If you don’t want to make a massive mess decorating it like I did then leave it in the tin. 8. 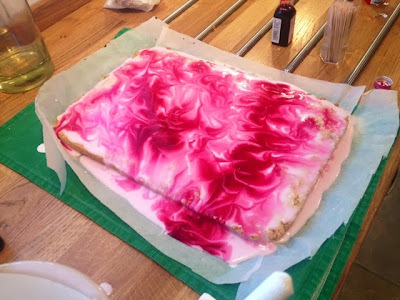 When cooled, mix up your icing. Sift the icing sugar into a bowl and stir in approximately 100ml water. 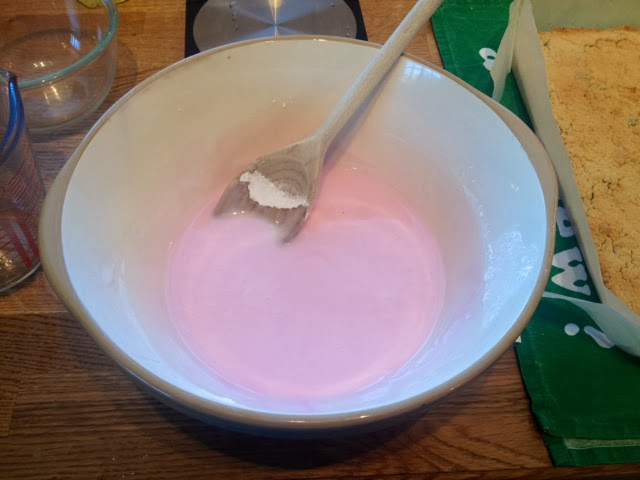 Add a couple of drops of food colouring to turn it a pale pink colour. 9. 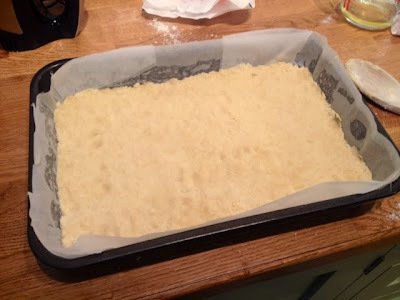 Pour the icing mixture over the shortbread (you can see below why I said leave it in the tin, mine poured off over the edges and went everywhere). Then drizzle over a few more drops of food colouring and use a toothpick or skewer to twist into a swirly pattern. 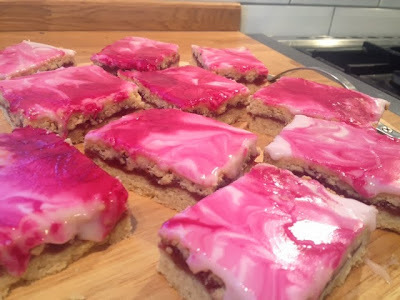 (I used slightly too much as it went very red and later on bled out into pale pink colour ruining the pattern a bit, so go easy on the food colouring). 10. Leave to dry, preferably over night. 11. Cut into squares and serve.